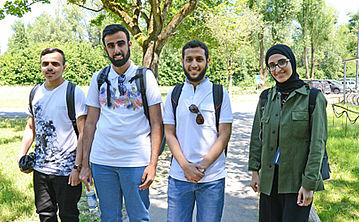 short report — The students from Saudi Arabia were able to have a detailed look at the laboratories at the Ludwig-Maximilians-Universitaet last week Thursday. In the cleanroom Dr. Vladimir Pervak explained to Abdullah Ali Alshehri, Ibrahim Abdullah Almuhanna, Rayan Khalid Alzahrani, Lamyaa Alasim and Saleha Mansour Alshalwi, how the production of optics for ultra-short-time laser physics works. Also included in the tour were the laboratories of Prof. Matthias Kling. The students are guests in the LAP team until the end of July, as a part of the Summer School for Quantum Optics;, a joint project between the Ludwig-Maximilians-Universitaet and the King Saud University. short report — Together with Prof. Abdallah Azzeer, Prof. Nasser M. Al-Daghri from King-Saud-University has complied with an invitation of Prof. F. Krausz to pay a visit to his MPQ-LMU laboratories and present a colloquium about his research on the 4-5th of December 2017. Prof. Nasser has an impressive track record in biomarker discovery. His lab has a variety of biochemical tools which will be used in the cooperation as valuable benchmarking methods for the analysis of blood samples. Moreover Dr. Nasser has built up a large biorepository from more than tens of thousands of Arab children as well as tens of thousands of adults in Saudi Arabia. His great deal of expertise in biomarker research together with his biorepository might provide important contributions to testing the applicability of field-resolved infrared molecular fingerprinting for biomedical diagnostics of other chronic diseases, such as diabetes mellitus. The utility of this approach, which had been developed in the laboratories of Prof. Krausz, is currently being studied in another collaboration with Profs. Jean-Marc Nabholtz and Khalid Al-Saleh for early detection of breast cancer. Following his excellent talk, which was received with great interest, Prof. Nasser and Prof. Azzeer discussed possibilities of starting a collaboration in the above research direction. Prof. Nasser, Prof. Azzeer and Prof. Krausz agreed to continue discussions about a starting joint activities upon Prof. Krausz’ upcoming visit at KSU. interview — Ayman Alismail, a PhD student from the King Saud University in Saudi Arabia, is working on his doctoral thesis at the Laboratory of Attosecond Physics of the Ludwig-Maximilians-Universität München. Here he reports on what it is like to live and work in Germany. Two Cultures – One Goal! interview — Dr. Abdallah Azzeer is Director of the Attosecond Science Laboratory (ASL) at the King Saud University (KSU) in Riyadh. 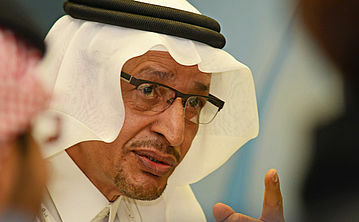 In his interview with MPQ Newsletter, he speaks enthusiastically about the relation between the MPQ and the KSU, the first attosecond flash achieved in the Arab world, and the wonder of international science. It is important to him to build the best environment for the next generation of scientists in the field of attosecond physics. We welcome our guests from Riyadh! short report — Today, we welcome visitors from Saudi Arabia to the Laboratory for Attosecond Physics. 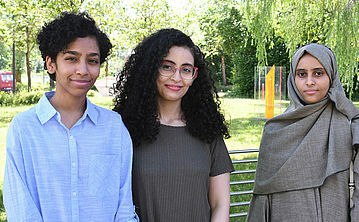 Nouf Jaber, Al Batool Aba Al-Khahil and Zainah Ali Al-Qahtani are studying at King Saud Universityin Riyadh, and have come to the Max Planck Institute of Quantum Optics for a month to broaden their knowledge of laser physics. As part of our collaboration with the King Saud University, we plan to hold regular Summer Schools specifically for female physicists from Saudi Arabia in the coming years. It is a pleasure to welcome this first group to Munich. We wish them every success, and hope they enjoy their stay in the Institute and in the city. pressrelease — The interaction between light and matter is of key importance in nature, the most prominent example being photosynthesis. Light-matter interactions have also been used extensively in technology, and will continue to be important in electronics of the future. A technology that could transfer and save data encoded on light waves would be 100.000-times faster than current systems. A light-matter interaction which could pave the way to such light-driven electronics has been investigated by scientists from the Laboratory for Attosecond Physics (LAP) at the Ludwig-Maximilians-Universität (LMU) and the Max Planck Institute of Quantum Optics (MPQ), in collaboration with colleagues from the Chair for Laser Physics at the Friedrich-Alexander-Universität Erlangen-Nürnberg. 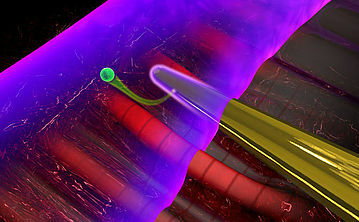 The researchers sent intense laser pulses onto a tiny nanowire made of gold. The ultrashort laser pulses excited vibrations of the freely moving electrons in the metal. This resulted in electromagnetic »near-fields« at the surface of the wire. The near-fields oscillated with a shift of a few hundred attoseconds with respect to the exciting laser field (one attosecond is a billionth of a billionth of a second). This shift was measured using attosecond light pulses which the scientists subsequently sent onto the nanowire. pressrelease — Light can conduct the play of atoms and molecules in the microcosm. Humans manage to interfere with this play. Researchers from the Laboratory of Attosecond Physics (LAP) of the Max Planck Institute of Quantum Optics (MPQ) and the Ludwig-Maximilians-Universität(LMU) and from the Department of Chemistry at the LMU have now used light to reconfigure hydrocarbons. 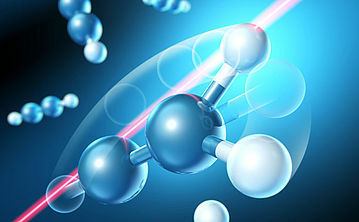 Using ultrashort laser pulses they removed an outer hydrogen atom from one side of a hydrocarbon molecule and directed it to the opposite side, where it reattached. The method could be used in the future to synthesize new substances by controlling chemical reactions. pressrelease — Scientists often need to detect and measure levels of specific substances in a sea of irrelevant molecules, and infrared light offers an ideal tool for this task. Infrared radiation is invisible to the human eye, but molecules react with mid-infrared light in ways that are extremely sensitive to their precise atomic structure. This provides a means of identifying with great specificity molecular solutes present in very low concentrations. 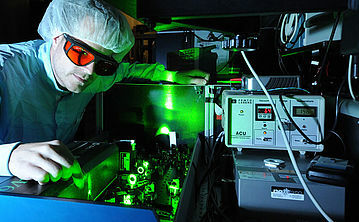 Lasers that generate light in the mid-infrared range suitable for use in molecular sensors are therefore the subject of intensive research. Now teams from the Ludwig-Maximilians-Universität (LMU) and the Laboratory for Attosecond Physics at the Max Planck Institute of Quantum Optics (MPQ), in collaboration with the Institute of Photonic Sciences (ICFO) in Barcelona, have developed a unique source of coherent radiation for this purpose. 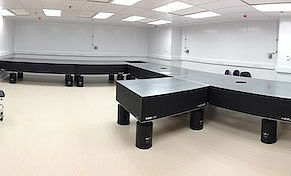 short report — The science of ultrashort metrology in the Attosecond Science Laboratory (ASL) in Riyadh picks up speed. The German/Saudi-Arabian team of physicists led by Prof. Ferenc Krausz and Prof. Abdallah Azzeer produced as the first team in the Arabic World isolated attosecond pulses in the ASL laboratory of the King Saud University in Riyadh. A big success for ultrafast physics in Saudi-Arabia. 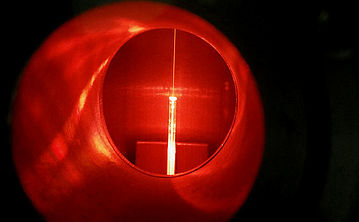 Attosecond-short light flashes are used for taking photographs of electrons. 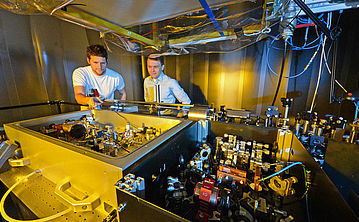 The team plans to observe the dynamics of electrons in molecules in the time dimension of attoseconds in order to examine processes in molecules in photoemission. During photoemission electrons are knocked out of atoms by photons (i. e. by light). This process is a major cause of damages to living cells. Increased knowledge about photoemission is thus crucial not only for physics, but also for medicine. short report — It would be tremendously beneficial to develop ways to detect and tackle cancerous development at a much earlier stage of the disease than is presently possible. 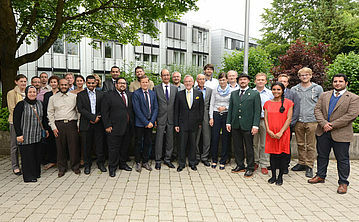 Last week on June 11th and 12th 2015, a workshop was held at the Max Planck Institute of Quantum Optics (MPQ) to discuss the latest advances, perspectives and challenges in the emerging research area of early cancer detection. 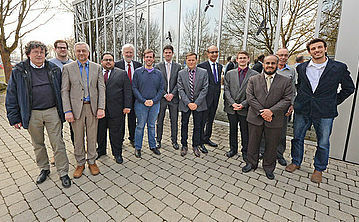 The workshop served to discuss joint efforts by scientists from the fields of cutting-edge laser physics, cell biology, cancer medicine, biochemistry and bioinformatics from MPQ, Ludwig Maximilian University (LMU), University of Innsbruck (Austria) as well as King Saud University (Riyadh, Saudi Arabia). Joint inter-disciplinary efforts and new approaches are building a bridge between novel laser technologies and clinically relevant cancer detection. These collaborative efforts have the potential to provide a springboard to detect cancerous onset earlier than ever. short report — During his visit to Saudi Arabia the Bavarian prime minister Horst Seehofer visited the King Saud University in Riyadh. After a short ride, leading through the whole campus, Seehofer went to the new Attosecond Science laboratory, which is run by the KSU in cooperation with the LMU Munich and the Max Planck Institute for Quantum Optics. 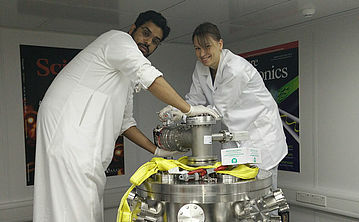 Here, Saudi Arabian Scientists and their Munich colleagues will research the movements of electrons together. Seehofer was impressed by the complex fundamental research and the unique collaboration. 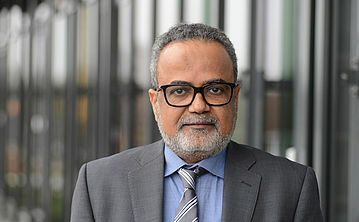 LMU rector Prof. Bernd Huber and Prof. Badran A. Al-omar (rector of the KSU), joined many journalists and members of the delegation for Seehofer’s visit to the lab, which lasted about half an hour. pressrelease — Electrons cannot hide anymore – even in Saudi Arabia. On February 16th, 2015, the new »Attosecond Science Laboratory« will be inaugurated at the King Saud University in Riyadh. It is the first attosecond laboratory in the whole Arabic world and a product of the collaboration between the Ludwig Maximilians University (LMU) Munich, the Max Planck Institute for Quantum Optics (MPQ) in Garching, and the King Saud University (KSU) in Riyadh. Researchers from the three institutions will use the new facility to investigate electrons in motion. short report — It's done - Nobel laureate Prof. Theodor Hänsch cut the ribbon and opened therewith the new Attosecond Science Laboratory in Riyadh. Here students are able to access high-class technology to develope and improve the research of attosecond physics. The ceremony was a big success and was highlighted by lectures of the three eminent scientists Paul Corkum, Gérard Mourou and Nobel laureate Theodor Hänsch. pressrelease — Chemical bonds between carbon and hydrogen atoms are amongst the strongest in nature and their selective breaking, in particular in symmetric molecules, is of interest to chemical synthesis and the development of new biologically active molecules. An international team of scientists has now demonstrated that ultrashort light pulses with perfectly controlled waveforms can selectively break C-H bonds in acetylene ions. 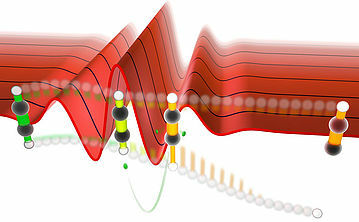 The researchers demonstrated that a suitable choice of the laser-pulse waveform leads to breaking of the C-H bond on the left (or right) side of the symmetric H-C≡C-H molecule. The scientists propose that their results can be understood by a new quantum control mechanism based on light induced vibration (Nature Communications, DOI:10.1038/ncomms4800). short report — Experts from KSU, LMU and the University of Innsbruck discussed new opportunities in early cancer diagnosis and treatment with next generation laser sources. The topics for future collaborative efforts include the development of the light sources, optical tools for breath analysis, in-vitro and in-vivo multi-photon fluorescence microscopy and nanoparticle mediated diagnosis and treatment of cancer. pressrelease — A team in the Laboratory for Attosecond Physics (LAP) at the Max-Planck-Institute of Quantum Optics has taken another step toward the achievement of complete control over the waveform of pulsed laser light. 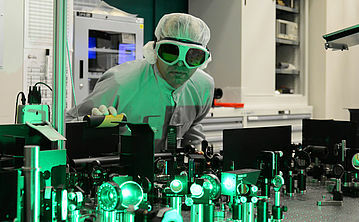 Together with colleagues based at LMU and the Technische Universität München (TUM), they have constructed a detector which provides a detailed picture of the waveforms of laser pulses that last for a few femtoseconds (1 fs = 10-15 seconds). Unlike conventional gas-phase detectors, this one is made of glass, and measures the flow of electric current between two electrodes that is generated when the electromagnetic field associated with the laser pulse impinges on the glass. The researchers can then deduce the precise waveform of the pulse from the properties of the induced current. Knowledge of the exact waveform of the femtosecond pulse in turn makes it possible to reproducibly generate light flashes that are a thousand times shorter – lasting only for attoseconds (1 as = 10-18 sec) – and can be used to study ultrafast processes at the molecular and atomic levels (Nature Photonics, DOI:10.1038/nphoton.2013.348, January 12, 2014). short report — The Department of Physics and Astronomy’s Laboratory for Attosecond Physics at King Saud University is currently taking shape. The first tables for laser experiments were recently aligned in the cleanroom, the femtosecond laser-system has reached the University, and the beamline for the production of attosecond light-flashes and their application in basic research is also ready to be set up. From now on, the construction of scientific tools is taking place and by the end of 2014, the laboratory-infrastructure will be completed. Copyright © 2019 Attoworld Riyadh. All rights reserved.